There are many online resources for neglected tropical diseases (NTDs), so I’m not going to reinvent the wheel. 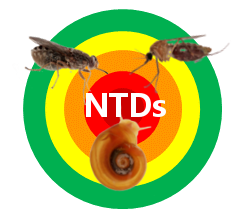 Instead these pages are designed to tell you a little bit about the specific details about the three NTDs that I am working on that are of relevance to my FOCAL-NTDs project i.e. aspects relating to their geographical distribution, plus links to some key documents relating to these diseases. To find out more about NTDs in general, I suggest you head to the World Health Organization (WHO) or the Centre for Disease Control and Prevention (CDC) webpages. Click on the links below or use the navigation buttons above to access information on the three diseases I am focussing on.